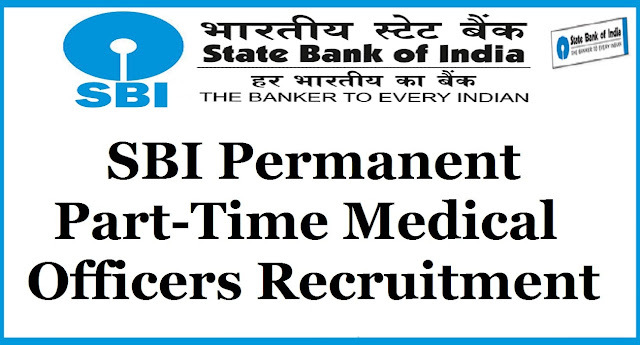 SBI Permanent Part-Time Medical Officers Recruitment 2017: SBI has published the Permanent Part-Time Medical Officers Recruitment 2017 notification and applications are invited from eligible Indian Citizens for appointment as Permanent Part-Time Medical Officers- I (PPMO-I) in State Bank of India. Candidates selected are liable to be posted anywhere in India . Prospective candidates will have to apply to after carefully reading the advertisement regarding the process of selection, eligibility criteria, application processes and payment of prescribed application fee/ intimation charges etc. and ensure that they fulfil the stipulated criteria and follow the prescribed processes. b) Post Qualification Experience: Minimum 5 years’ experience as a General Practitioner reckoned as on the date of eligibility from the date of registration with the Medical Council of India (MCI). Experience gained during internship will not be counted. Vacancies are reserved for Disabled (Physically Challenged) Persons under Section 33 of the Persons with Disabilities (Equal Opportunities, Protection of Rights and Full Participation) Act, 1995 (1 of 1996) as per government guidelines. Candidates with Orthopedic disabilities are eligible to apply as per the definitions given in the above act. A person who suffer from not less than 40% of Orthopedic disability and wants to avail the benefit of reservation will have to submit a Disability Certificate issued by Medical Board duly constituted by Central or State Government. The certificate should be dated on or before last date of registration of application. The selection will be through shortlisting & Interview. PAY: The starting basic pay is Rs.23,700/- in the scale of Rs. 23,700 – 980/7 – 30,560 – 1,145/2 -32,850 applicable to Permanent Part-Time Medical Officer - I (PPMO-I). The salary and other benefits DA, CCA, LFC, Medical facility etc will be as per the Uniform Terms and Conditions of service applicable to such officers. The compensation per annum is ranging between Rs. 6.66 lacs to Rs. 6.87 lacs depending upon place of posting. Through Demand Draft favouring “CRPD, State Bank of India” payable at Mumbai. Application Fee once paid will NOT be refunded on any account nor can it be held in reserve for any other examination or selection. Completed application with enclosures should be sent to “The General Manager, State Bank of India, Central Recruitment & Promotion Department, 3rd Floor, Atlanta Building, Nariman Point, Mumbai - 400 021. Last Date for receipt of the printout of online application alongwith enclosures at the address mentioned above: 06.02.2017. 1. The application format is available on Bank’s website www.sbi.co.in/careers/. 2. Candidates should download the application format and complete it in all respects. 3. The completed application with photograph & signature of the applicant should be sent by post / courier to the address mentioned in the application along with self-attested copy of following papers. 1. Proof of age (Copy of 10th standard/ 12th standard certificate or Discharge certificate showing the Date of Birth). 3. Proof of education certificate. 4. Discharge certificate by Ex-servicemen candidates. 7. Cast certificate issued by competent authority on format prescribed by the Government of India in case of SC/ST. 8. OBC Certificate containing the ‘Non- Creamy Layer’ clause issued by the competent authority during the period 01-04-2016 to the date of interview. (For OBC- Non Creamy Layer applicants). 9. Original Demand Draft of Rs. 600/- favouring “CRPD, State Bank of India”, payable at Mumbai towards Application Fee. 10. Brief write-up / Resume as separate annexure, describing career and performance achievements in service and details of gallantry awards/medals if any with supporting documents. 11. Candidates serving in Government/ Quasi-Government offices, Public Sector undertaking including Nationalised Banks and Financial Institutions will be required to submit “No Objection Certificate” from the employer at the time of interview. 1. While applying for the post, the applicant should ensure that he/she fulfils the eligibility and other norms mentioned above as on the specified date and that the particulars furnished by him/her are correct in all respects. 2. In case it is detected at any stage of recruitment that a candidate does not fulfill the eligibility norm s and/ or that he/she has furnished any incorrect/false information or has suppressed any material fact (s) his/her candidature will stand cancelled. If any of these shortcoming(s) is/are detected even after appointment, his/her services are liable to be terminated. 3. Candidates belonging to reserved category including Persons with disabilities for whom no reservation has been mentioned are free to apply for vacancies announced for unreserved category and they must fulfill all the eligibility conditions applicable to unreserved category. 4. Candidates should have valid e-mail ID which should be kept active during the currency of this recruitment exercise to receive call letters and other communications, if any. 5. The candidates should be medically fit to move freely and undertake tours independently and should not be suffering from any major ailment(s) which may adversely impact his performance in the Bank. Appointment of the selected candidate is subject to his/her being declared medically fit by medical officer (s) appointed/authorized by the Bank. 6. The Bank takes no responsibility for any delay in receipt or loss of any communication in postal transit. 7. The applicant should ensure that the application is strictly in accordance with the prescribed format and is properly and completely filled. 8. Any legal proceedings in respect of any matter of claim or dispute arising out of this advertisement and/ or an application in response thereto can be instituted only in Mumbai and courts /tribunals/forums at Mumbai only shall have sole & exclusive jurisdiction to try any case/dispute.